Previous calculations of the internal structure and thermal evolution of Kuiper Belt Objects (KBOs) by Desch et al. (Desch, S.J., Cook, J.C., Doggett, T.C., Porter, S.B. . Icarus 202, 694–714) have predicted that KBOs should only partially differentiate, with rock and ice separating into a rocky core and icy mantle, below an undifferentiated crust of ice and rock. This crust is thermally insulating and enhances the ability of subsurface liquid to persist within KBOs. 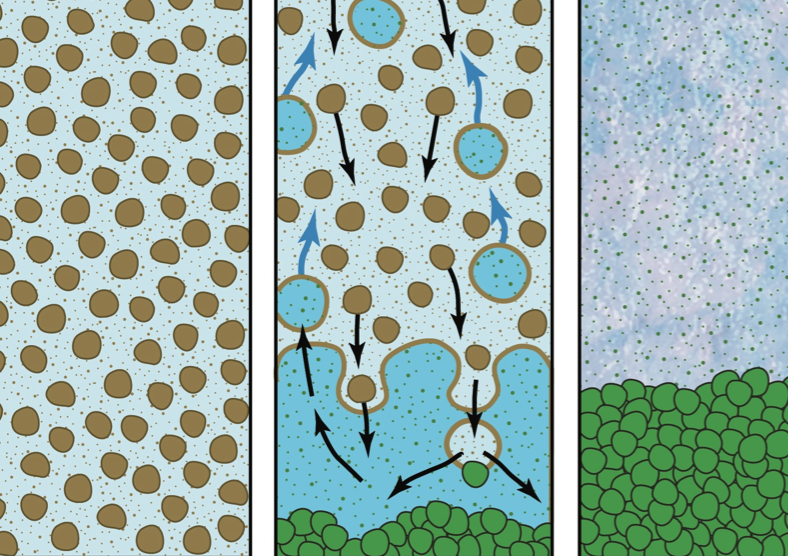 A dense rock/ice layer resting on an icy mantle is gravitationally unstable and prone to Rayleigh–Taylor (RT) instabilities, and may potentially overturn. Here we calculate the ability of RT instabilities to act in KBOs, and determine the thickness of undifferentiated crusts. We have used previously calculated growth rates of the RT instability to determine the critical viscosity of ice needed for the RT instability to operate. We calculate the viscosity of ice at the cold temperatures and long timescales relevant to KBOs. We find that crustal overturn is only possible where the temperature exceeds about 150 K, and that RT instabilities cannot act on geological timescales within about 60 km of the surfaces of a KBO like Charon. Although this crustal thickness is less than the 85 km previously calculated by Desch et al. (Desch, S.J., Cook, J.C., Doggett, T.C., Porter, S.B. . Icarus 202, 694–714), it is still significant, representing 25% of the mass of the KBO. We conclude that while RT instabilities may act in KBOs, they do not completely overturn their crusts. We calculate that Saturn’s moon Rhea should only partially differentiate, resulting in a moment of inertia C=MR2 0.38.